Explore new depths and get started on your diving adventure with training from certified scuba instructors at Aquatic Adventures in Zephyrhills, Florida. Get helpful advice from master repair technicians at our store and full-service repair on nearly all dive equipment. Our staff of certified dive instructors are also avid dive enthusiasts. From recreational diving to technical diving, our staff has the expertise you are looking for. Our dive instructors dive every single month, daily if possible and are fully committed to our customers and students. Zeagle Express through Aquatic Adventures of Florida work together to offer full-service repair on most brand names. 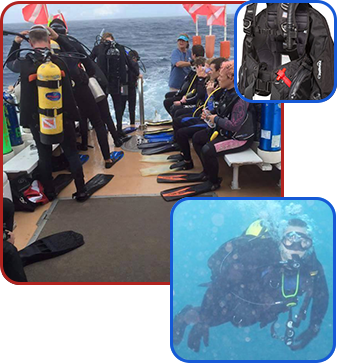 All repair technicians are dive instructors and are experienced in repairing or servicing all types of dive equipment. We keep things interesting at Zeagle Express by adding new lines of dive gear, so check back often for new equipment. With 35 years of experience using and selling dive equipment, Zeagle Express stands behind every product we sell. This Canadian born Florida resident started diving in 1976 in the cold waters of the Great White North. True to his heritage his first open water dive was in December of that year through a hole in the ice. An instructor since 1996, Rick teaches classes for PADI, SDI, TDI, NACD and DAN, he uses his extensive experience in all of his teachings from training Open Water Divers to Fully Certified Cave divers. Rick's diverse scope of diving experience, ranges from basic recreational to full technical and limited commercial diving. If Rick doesn't do it yet he's learning how. Rick will teach you basic skills to some more advanced techniques depending on your personal goals. They say behind any successful man is a woman and Diana is no exception. She often works behind the scenes where and when possible. No small accomplishment given her busy daily personal routine. Scuba diving became a pivotal aspect of Diana's life when she married Rick. Having completed open water certification in February 2001, she soon advanced to higher certification levels. Underwater videography and photography are of a special interest to Diana. She is a professional educator who has been teaching since 1987 following her graduation with a Bachelor's of Fine Arts from Bowling Green State University, Bowling Green, Ohio. She received a Masters Degree in Education from Saint Leo University, Saint Leo, Florida in 2001. Consider this unique experience, a marriage where both the husband and the wife encourage one another to pursue their unique gifts and interests. Diana feels she is blessed that her husband's vocation is scuba, a sport he loves to participate in and share with others. He is also her staunchest supporter in encouraging her to pursue the sport of scuba and her talents as an artist. In December of 2001, Rick surprised her by renovating one of the largest rooms in their home into an art studio. Later he built a 1250 sq ft studio. If Diana isn't scuba diving she is in her studio perfecting her talents as a visual artist. Portraits are her specialty as they pose a unique challenge at every opportunity. This is an area where God has blessed her. If you were to ask her why a portrait rather than a photograph the reply would be "Portraits portray a beauty that cannot be caught on photo paper", unless it is a photo of one of her portraits . This art form gives her many opportunities to seek God and ask him to show her the beauty he sees in the person she is painting. The art works on this website, the Genesis Diving Institute's FROG Logo and the MO-Diver Character are her original works. If you are interested in purchasing prints of the work or to commission a portrait for yourself or someone special in your life, please contact Diana at Aquatic Adventures of Florida. We have the largest inventory of Zeagle products anywhere. We'll ship today, domestic or internationally. Zeagle pioneered the practical weight-integrated buoyancy compensation device (BCD) system, which is why they have more experience designing and manufacturing weight-integrated systems than any other company. For over 35 years, Aquatic Adventures of Florida, the oldest Zeagle products dealer, has helped Zeagle develope buoyancy systems for the casual recreational diver, the technical diver, and for the most specialized military applications. Get the best deal with our price matching service. We will match or beat all other Zeagle dealer prices and prices on many other product lines we carry. Give us a call with the new price, show us the proof, and we will match it or beat it; and then ship it right out. Be aware of anyone pricing lower than Zeagle Express, they may not be an authorized Zeagle Dealer!